Gareth Long - Education: Screaming guitars not for me..... not yet anyway! I must admit it was great fun and certainly made me focus and really concentrate on a variety of skills simultaneously, left and right hands doing different things, watching the screen – and the notes to be played were certainly whipping along fast at one point. No contortions or leaping with screaming guitar sounds for me – I was too busy concentrating. Lots of people knock games such as this, but it really does develop a range of skills including cognitive development, co-ordination, concentration, multitasking and personal challenge (along with being able to have just plain fun). Wii's are now in many schools serving a variety of very useful educational purposes - I'm sure that everyone will have them soon. 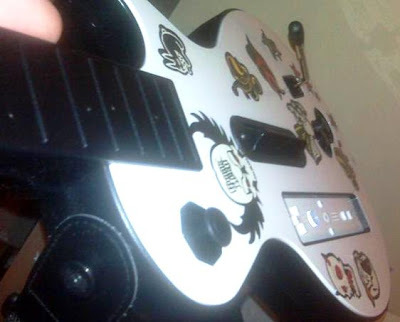 Back to Guitar Hero though - my eldest daughter, still a teen ( only just!) is, inevitably, not just better than me, she is very accomplished at it. She must have spare time on her hands… maybe I should do something about that…. Schools should definitely not write this form of technology off! Do I want to do it again - yes definitely. I failed to finish last time and that is something I don't like doing - ever!